Al got me hooked on steno pads back in the studio days. Nothing says task list like a bunch of line items in a steno. I lost a steno pad once and hated myself for weeks. Tasks. Phone numbers. Cartoons. Gone. So I started to tape a business card on the front of the steno pad in case I left it somewhere. 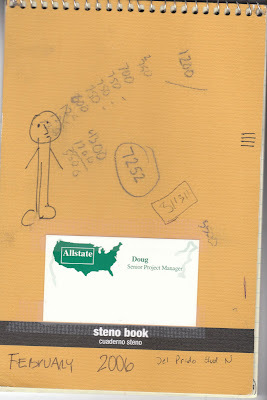 Steno pad (circa Allstate days) waiting to be left behind at a bar. So, of course, I did. Six months ago. Hey Doug, I think we have a notebook you left at Buffalo Wild Wings in Lancaster (or at least I remember seeing your name on it.) It has some pictures of some tape measures being tortured and held for ransom. Sound familiar? Anyway, stop by Buffalo Wild Wings and I'll get them back to you. We all had a big laugh at them. The photos she mentions are here: http://www.holyjuan.com/2008/05/torture-by-foot.html. I can see why they might have waited six months to contact me. Thank you Becky at BW-3 in Lancaster!! Those guys who set that up are pretty crafty... and handsome. Two men, six days including hotels and car rental plus 1200 for flights? I miss the steno pads. Coincidentally, I recently found one with notes taken during a conference call. The page was headed with, "Doug is a weenie and everything else like that". Target: Expect Less. Pay More. Google still using IE 6.0?